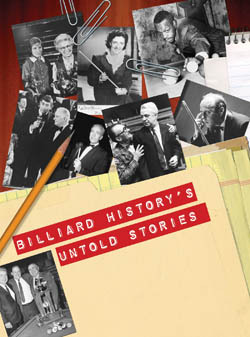 In BD's new bi-monthly series, "Untold Stories," journalist R.A. Dyer uses new interviews and research to unearth forgotten tales, reconstruct seminal events and shine light on back-room characters from the glory days of pocket billiards. You can check here for new installments of the series and the archive, and you can dig into research materials like interview transcripts and little-seen photographs on the "Untold Stories" Web pages at www.poolhistory.com. Did Fats Have Any Children?